PetGiftBox has already surpassed Petbox in terms of dog awesomeness around here. The boxes have just been getting better and better since they started. I'm loving all the improvements and the variety that each box has. 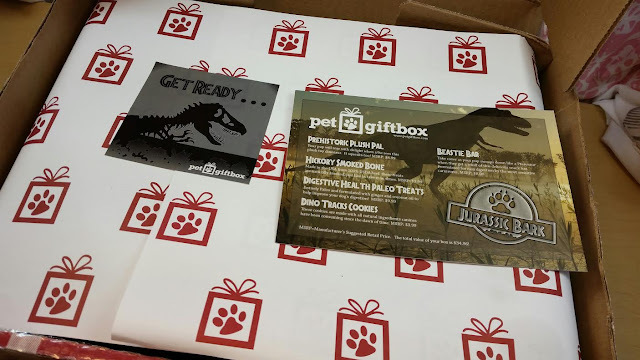 I also love the June theme which is "Jurassic Bark." I haven't seen Jurassic World or whatever it's called but it does have Chris Pratt in it so I'm sure I'll see it when I get around to it. I have seen Jurassic Park. In the theatre. When it came out. Do you *know* how long ago that was?! It scared the crap out of me and I actually screamed in the theater when that velociraptor killed the bad guy with glasses. 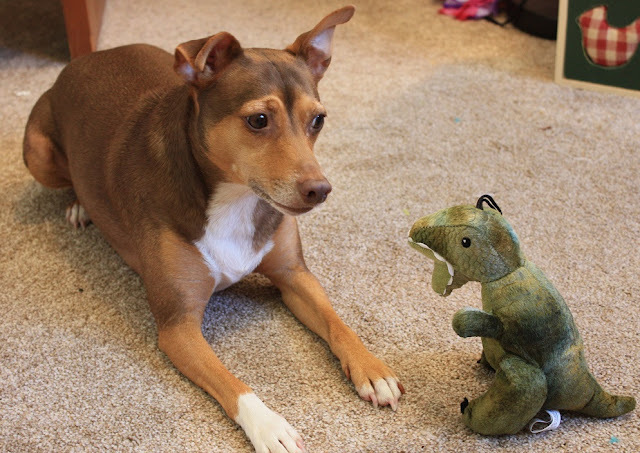 But anyway, that movie gave me additional respect for the awesomeness of dinosaurs and I'm happy to share that with my furry kids. 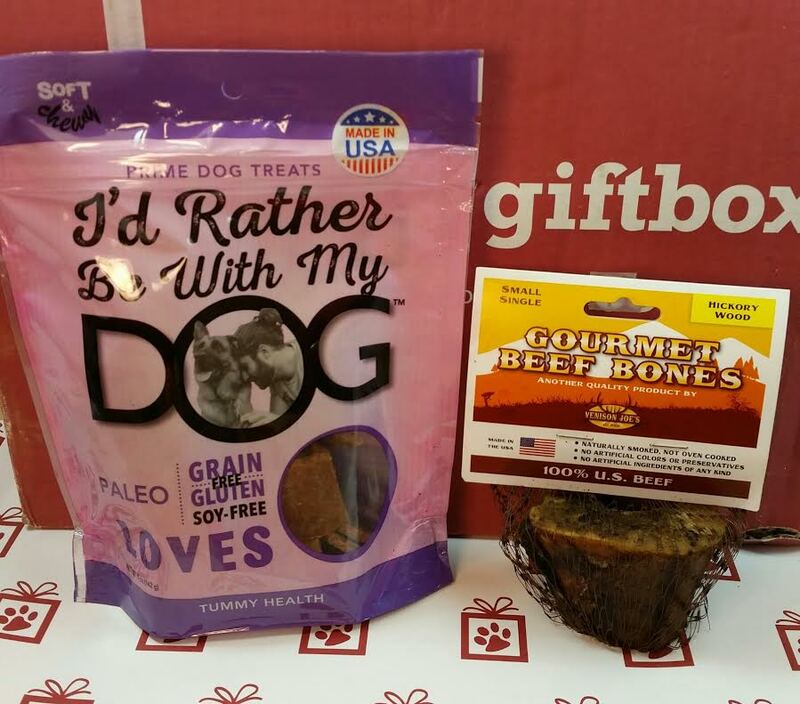 I'd Rather Be With My Dog Loves Tummy Health Treats- These are soft, breakable treats that can be used as training rewards. They are made in the USA and are grain free. You know what's weird? This might be the first treat where the dogs were not too sure whether they wanted to eat it or not. Normally they eat without thinking but these got some sniffs and then were delicately taken from my hand. One of the spices used must not smell too good. Turmeric, maybe? What a weird thing to put in a dog treat. Hickory Smoked Bone- This is a bone from a US cow so I'm happy. This was a HUGE hit with Dexter. He loves bones like this. So Bugsy played with his toys and Dexter nommed his bone. Both were very happy. D.O.G. Bakeries Dino Tracks Cookies- Two large, all natural pet treats with peanuts and pumpkin. The boys loved these and I loved that there were two of them. I watched a documentary about dogs that said they know what is fair and what isn't. So if one dog gets a treat and the other one doesn't for performing the same trick, the one who doesn't get treats will eventually stop doing tricks if he can see that the other dog is getting a treat for the same thing. Beastie Bar- These have popped up in a couple dog subscription boxes I get. I like them but I wish they took longer to eat. They're so soft that I feel like I need to break it up or else they wolf the whole thing down in two seconds. It's definitely not like giving them a bully stick. These are made in the USA and contain all natural ingredients. 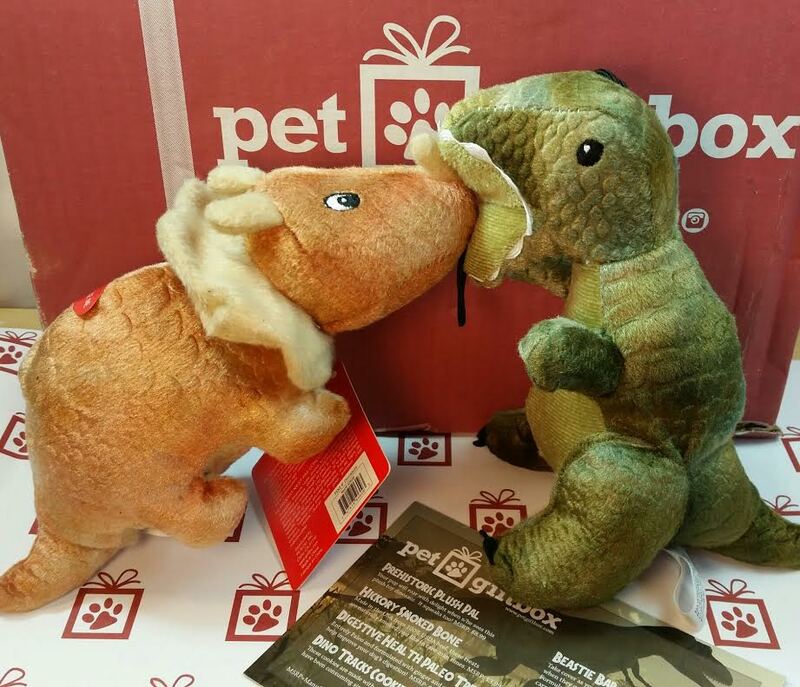 VERDICT: After digging around it looks like the boxes either contained an extra dino toy or an extra treat. I saw one box that had a giant turkey claw! So there are some variations this month. Actually... That could be because of the sizing. I bet the giant turkey claw was for bigger dogs. Either way, this box is pretty awesome. I love the theme and the contents. OMG! Wait! I totally forgot! 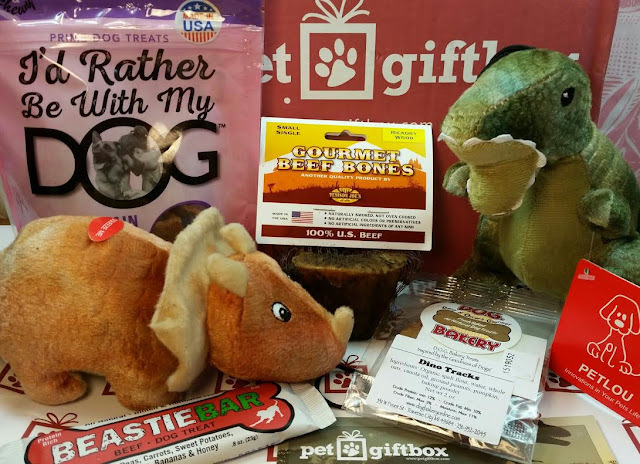 There's a Groupon Deal for PetGiftBox! You'll get 3 months for $25 and if you buy today (6/19) you can use coupon code SUPER25 and get it for $18.75!! That is a crazy deal! And if you use Ebates, make sure to activate it because you'll also get 6% cashback. Do you get a dog box you love? Which one? 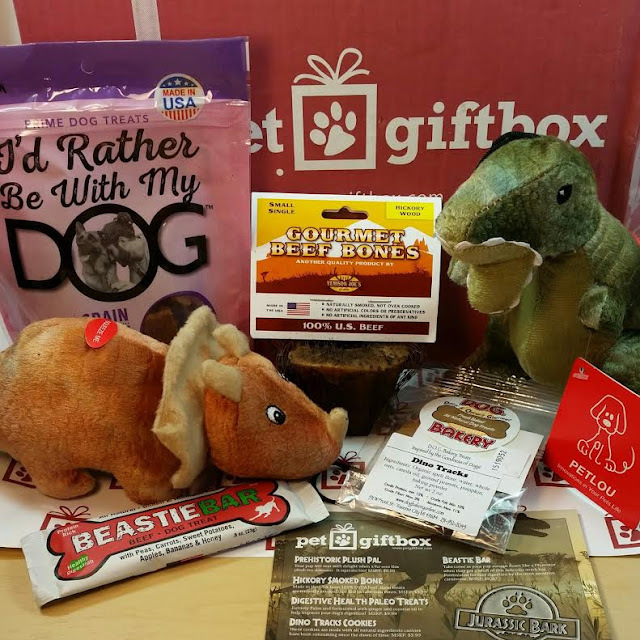 I get a few but PetGiftBox is one of my favorites. *This box was provided to me for review purposes. All dinosaurs opinions are entirely my own. Ha, how cute that they did a Jurassic Park theme! And you must see Jurassic World if you liked the original Jurassic Park movies, it was so good! Everyone has been saying it's great! We don't go to the movies much but I think we should make an exception for this one.